Monument (noun) – a structure erected as a memorial; an inscribed marker placed at a grave; something venerated for its enduring historic significance; an outstanding enduring achievement; an exceptional example. A familiar word, applicable to the specific and particular, as in Wren’s ‘Monument of the Fire of London’ and the general, as in ‘a proliferation of statues and other monuments’ or ‘the speech was a monument to tedium’. An action or series of actions can ‘stand as a monument’ to a wider cause or virtue. 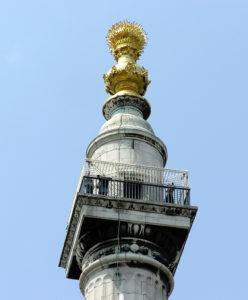 Yesterday saw a ‘monument’ venerated for its enduring historic significance – a cycle race. Liege – Bastogne- Liege is the last of a short series of one day races taking place in northern France and the Low Countries. 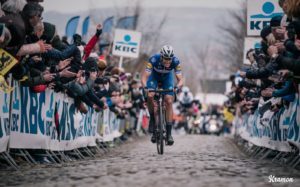 Three of these races are now designated Monuments – the aforementioned Liege race, the Tour of Flanders also known as De Ronde and Paris Roubaix, also known as L’enfer du Nord. 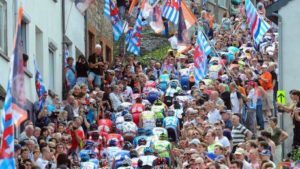 A fourth Milan – San Remo, or La Primavera in Italy, was the first Monument of the season, taking place in March and a fifth, Il Giro de Lombadia, also Italian, will happen in October. 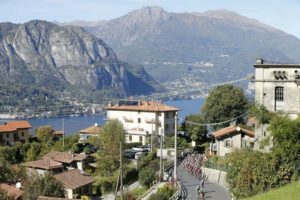 This race, ridden on one of the most beautiful courses around the north Italian lakes, is known as the race delle foglie morte or, more romantic-sounding, the race of the falling leaves. So five Monument races, all over a century old, all very long (about 250 km or longer) and each with its unique characteristics. Milan- San Remo, the longest, is often a sprinters race, Paris Roubaix has bone-jarring Napoleonic cobbled country lanes, Flanders has short, sharp climbs as well as cobbled sections, Liege and Lombardia are climb-filled. All are hugely anticipated by cycling fans and each of them is hotly contested by the very best riders. The crowds on the hills in yesterday’s race were sometimes ten deep. It’s easy to see why these races are regarded as monuments to the sport, but the official designation of ‘Monument’ is a recent one, I believe. I hadn’t heard it before this century. Before that there were one day races simply called ‘Classics’ ( and classics ) and there were, and still are, a lot of one day races which claim this designation. I assume that the name change came about through the UCI (Union Cycliste Internationale) but a trawl through its web-site yields nothing – not even a Press Release. So I went elsewhere to try and find the source of that capital ‘M’. Rob Hatch and Carlton Kirby commentate on cycling for Eurosport (and the latter will be known to regular readers of this web-site, as someone who has commented on blog posts before) and I tweeted my question to them. An interesting debate ensued with fellow cycling fans which identified a number of theories ( thanks to Tim and Paul ). Was it to do with the proliferation of WWI war graves and cemeteries in northern France and the low countries? But that wouldn’t apply to the Italian races. Was it a modern marketing decision? I still haven’t found the answer. I have, however, been recommended what looks like an excellent book entitled The Monuments by Peter Cossins (Bloomsbury Sport 2015) and regular readers will know how I like to feature a book. Once the Clapham Book Fest is over I’ll be happily reading it, while watching the Giro. Now, there’s a race….. This entry was posted in History, Words and tagged History, Words by juliej. Bookmark the permalink.